Hoosier Energy is taking rights-of-way vegetation management to a whole new level. Trees and brush in Hoosier Energy rights-of-way are being trimmed by 10 saw blades connected to a helicopter. Aerial trimming is the most cost-effective way to maintain rights-of-way and is very safe. During Hoosier Energy’s first aerial trimming project, the crew was able to complete 62 miles of side trimming in approximately three weeks. A ground crew managing the rights-of-way vegetation would take three to four months to complete the same distance. The helicopter crew consists of one pilot and one ground mechanic. They attach sections of aluminum pole below the helicopter in 20- and 30-foot lengths. Once in the air, the pole hangs about 100 feet below the helicopter. A 50-horsepower engine powers ten 20-inch circular saw blades with carbide tips to keep them from breaking. it all the way to the ground. This process creates a perfect edge from the ground to the sky along the rights-of-way. “In addition to the time savings, aerial trimming is also safer. The traditional vegetation management process would require multiple workers to be high up in trees, significantly increasing safety risks,” said Jared Murphy, Hoosier Energy’s Vegetation Management Coordinator. The aerial saw has two fail safes for the saw blades, a mechanical release and a hydraulic release. If one of the releases would fail, the pilot can use the back-up method to release the saw in the event it would get hung up. According to Murphy, this first project saved approximately 10 percent compared to completing the project with a ground crew. The aerial trimming method also minimizes the need to repair landowners’ property due to heavy machinery that can damage the land. 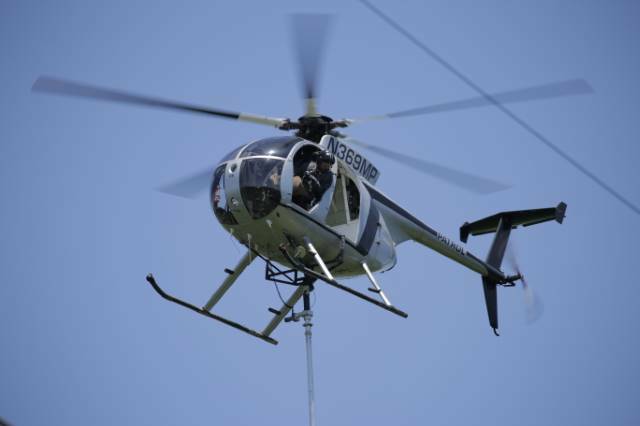 This is the first time Hoosier Energy has used the aerial trimming method. “We learned that planning ahead is everything,” said Murphy. “It’s important to make sure the rights-of-way are flagged with obstacles like fences, deer stands and any buildings or structures at the edge of the rights-of-way.” Planning ahead allows the crew to move quickly through the process. The Hoosier Energy ground crew is also responsible for making sure that anyone that lives in a home next to the rights-of-way are evacuated from the home prior to the pilot beginning the trimming process. The Federal Aviation Administration requires everyone to be at least 160 feet away from the homes to ensure safety. Murphy and his crew consider this first project to be a success and plan to continue the use of aerial trimming for future projects.